The Upper School at Greensboro Day School delves into unique learning opportunities that challenge students to discover who they are and who they hope to become. A broad range of challenging classes and approaches allow our students to pursue their interests on a deeper level with specialized topics such as Contemporary Global Issues, Astronomy, and Cabaret. Experiential, hands-on opportunities encourage our students to take learning beyond the walls of the classroom. 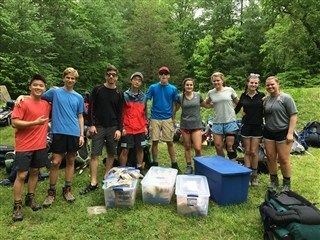 Juniors push their limits for five days backpacking through Pisgah National Forest, while Seniors spend four weeks off campus exploring a possible career. Options for real world experiences abound with options for global travel to destinations including South Africa and Iceland. To remain current in our ever-changing world, technology is utilized in many ways –teachers moderate online discussions, post videos of class lectures, develop class web pages, and tweet project suggestions. GDS is a place of high expectations. Yet, with so much support, it’s hard to be left behind, and it’s easy to get ahead. Our Student Support Services are here for all students, whether they need enrichment or extra help. Our staff of curriculum specialists, counselors, and learning specialists assist teachers, students, and parents in helping children reach their academic potential. The Upper School Advisory Program at Greensboro Day School builds relationships that foster a climate of support for interpersonal and academic wellness. The primary goals for the Advisory Program are to provide both academic and interpersonal support for students, develop strong relationships with adults in the community, create time and space for worthwhile discussions, increase school spirit and a sense of community. Advising creates a supportive environment outside the classroom where every student receives individual attention. 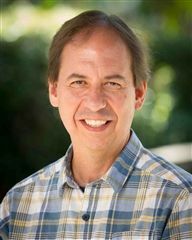 Most Upper School faculty serve as advisors to students. The advisor serves as the student advocate; assisting with transitions, creating strategies for problem-solving, and supporting students in their search for balance among academic, athletic, and leisure activities. Advisory groups are made up of students in all grade levels and they remain in the same group throughout their upper school tenure. Advising allows students to work together on a curriculum focused on social and emotional skills. We believe this allows students the opportunity to develop relationships that have a double impact: mentoring and friendship. 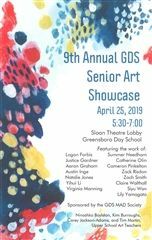 Greensboro Day School offers a range of core and elective courses to our Upper School students. To see the curriculum in a grid format, please download it here. The 2019-20 Program of Study lists all currently taught courses and relevant course descriptions. For information regarding course placements for next year, current GDS parents and students should visit the course bulletin board. Greensboro Day School's Winter Term began in January 2016 with 9 days of intensive study for all Upper School students. This is an innovative beginning to the spring semester allowing students to select from 25 classes (half-day and full-day) on a variety of topics. The 2019 Winter Term will be held January 3 - 14, 2019. The 2019 course catalog may be found here. The Upper School Counselor provides social and emotional support and programming for the Upper School community. Working with students in the classroom, in groups, and individually creates easy access and a comforting environment. The counselor is available by appointment and on an as-needed basis for students and their parents. Short-term assistance is provided and appropriate referrals are made to professionals in the community, if needed. The Upper School Counselor is a member of the Health and Wellness team and teaches substance abuse prevention, ethical decision-making, and healthy relationships and communication as part of the curriculum. The counselor also works collaboratively with faculty and administration to support student life. This is a first-semester program required for all 9th-grade students. The class provides exercises and instruction in the desired Bengal habits of academic wellness. Academic Wellness is the balance between academic work, leisure time and extracurricular activities. Topics include responsible use of technology and information (using both online and media center resources for personal research), organization, time management, test-taking skills and study skills. This course is not graded. Tutoring for specific subjects is provided both by GDS tutors, community practitioners, and peer-tutors. This support can be coordinated through our Learning Resource Specialist. Writing Help focuses on helping all students at all stages of the writing process. Students who are teacher or self-referred can expect to receive help and instruction in the following areas: brainstorming and developing ideas, drafting, outlining and organizing, revising, and editing. Students may receive help on papers in all subject areas.